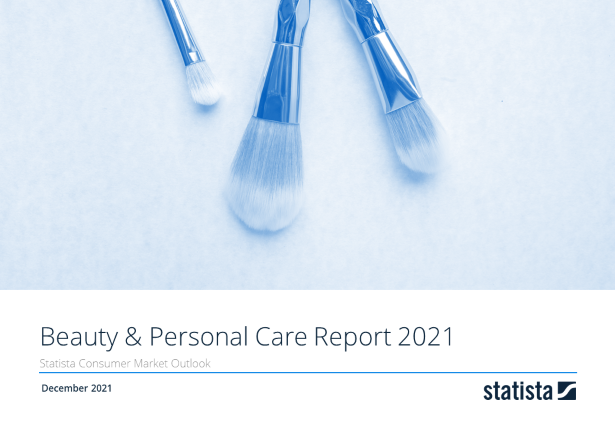 Revenue in the Cosmetics & Personal Care market amounts to US$1,161m in 2019. The market is expected to grow annually by 2.0% (CAGR 2019-2023). The market's largest segment is the segment Skin Care with a market volume of US$463m in 2019. In global comparison, most revenue is generated in United States (US$79,814m in 2019). In relation to total population figures, per person revenues of US$197.87 are generated in 2019. The Cosmetics and Personal Care market is defined here as consumer goods for beauty and body care. Beauty services, such as hairdressers and nail salons, are not included. All shown sales values refer to the retail value and include sales taxes. Products that primarily serve medical purposes are also excluded here but shown as part of the OTC Pharmaceuticals market. The cosmetics industry is characterised by a handful of global players with internationally recognized brands of which the most important are L'Oréal, Unilever, Procter & Gamble, Estee Lauder, Shiseido and Beiersdorf. The most important trends in the industry are the growing importance of emerging markets, especially in the Asia-Pacific region, as well as a noticable upturn in the usage of colour cosmetics, mainly driven by social media. Reading Support Revenue in the Cosmetics & Personal Care market amounts to US$1,161m in 2019. Reading Support The Cosmetics & Personal Care market is expected to show a revenue growth of 2.4% in 2020. Reading Support The average revenue per person in the market for Cosmetics & Personal Care amounts to US$197.87 in 2019. Reading Support In the Cosmetics & Personal Care market, 40% of total revenue will be generated through online sales by 2023. Reading Support With a market volume of US$79,814m in 2019, most revenue is generated in United States. Here you can find more studies and statistics about "Cosmetics & Personal Care".